Working for a Web Marketing company. 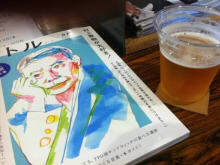 I'm big fan of Haruki Murakami, so called "HARUKIST", and also hold reading club sometimes. I prefer to read novels of writers overseas Fitzgerald, Capote, and Dostoevsky, mainly in Japanese, sometimes in English. So you can follow Charactor's gait by your own foot ! I was looking through activities as i wanted to do something more unusual apart from just sightseeing in Tokyo.And then i saw it: "What We Talk About When We Talk About Haruki Murakami". This obvious wink for any of Haruki Murasaki's fans led me and my friend to a meeting with Masato. We had a great time, talking about Murakami's work and learning interesting trivia known only to few even in Japan. We also went to Sendagaya - a part of Tokyo Murakami used to live in - to see places from his youth, including the location of the jazz bar he used to run or that one baseball stadium where he had his eureka moment. Meeting with Masato is a must for every "Harukist". He is very passionate and you can feel that he really likes discussions. So aside of a tour don't forget to sit in a cafe! A great tour for people who love the novels of Haruki Murakami. Our host spoke excellent English and gave so much insight into the author's history and reception. It was fun to drink beers at DUG and talk about music, too.